I think this article has been done to death but there is another angle to this article which few people have ever brought up. That the magic hour is not really a fixed value of time that is consistent with every country in the world. Each country has it’s own Magic hour as well as it’s own conditions which one must follow in order to make full use of it. For example I have lived in Penang, and now I am in KL. I can honestly tell you that the magic hour for these places varies so anyone who says its a fixed specific hour is saying it relative to where they usually take their photos. First let me state this, it is very hard to take sunsets or sunrise in Malaysia why? Because we hardly ever have a clear blue sky unlike countries found in the Northern or Southern hemisphere (there is also an exception to this such as developing countries like China where the skyline is rarely seen anymore caused due to haze and pollution caused by industrial development but for argument’s sake we will say that generally countries found in those regions have a better chance of clear skies). So whenever we do get a blue clear sky, you will see me take the day off from work and go out and just to have fun with my photography. Why is clear sky important? Isn’t obvious? The reason is so the light from the sun as it rises over the horizon can actually be seen instead of being filtered through cloud or haze turning its golden rays into dull Grey. Which makes everything look like crap. Though there are some possibilities of turning this event to your advantage but I’ll save that topic for another day. 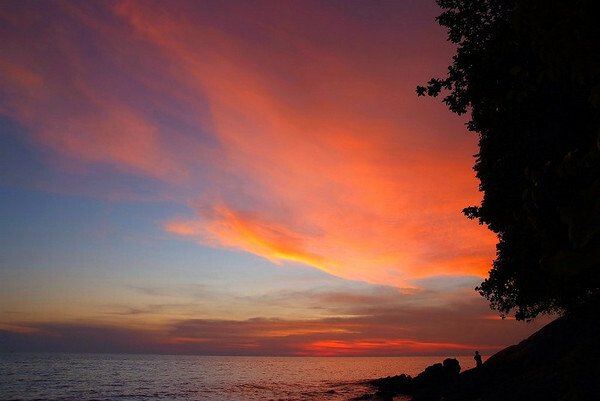 Here is an example of when the sky is just right in Malaysia for a great sunrise. For your information, sunrise is best at 6:45am ~ 7:45am in Penang Malaysia while sunset has an interesting time from 5:50pm ~ 7:45pm depending on weather. The pic above is a sunrise taken at 7:30am. Here is a shot of a sunset taken at west side Penang, Malaysia at 7:30pm. Now the next question comes, at which part of the magic hour should a pic be taken, this is a rather easy question if you have a digital camera, take a shot every time you think it looks good. There is no sure fire way of knowing when its time to take the shot as the sunset or sunrise is dependent on weather which changes constantly, in short keep shooting! For film, same thing although I wouldn’t recommend shooting non-stop since you only have 36 shots per roll and you don’t want to miss the highlight of the whole event while changing film. So shoot sparingly and try to make the shot count. Next we have KL, sorry but I won’t be including any shots I took of KL as I took most of them using film which exaggerate the colors and will not reflect the actual scene I saw. But from what I have seen it seem the sunrise is best between at 7:15am ~ 7:45am and the sunset is at 7:00pm till 7:45pm. The best way to determine what is the magic hour in a given place is to be observant, (simple but I have met dolts we simply don’t know how to determine) just look at when the sunrise and sunset takes place and note down the time. Don’t assume it will happen at 7am or 7pm. Some places like Labuan have their sunset at 5pm ~ 6pm while its already dark at 7pm. This whole equations get even worse with daylight saving but I’m not sure as I never lived oversea for more then a few months or even weeks. Also when trying to determine the best time for sunrise or sunset for a given place, have a compass handy, why? One thing we can determine is universal for all places on Earth, the sun will always rise from “the East and sets to the West” so as to determine where it will be best to take your shots from during the those times. Oh and another thing, try to go along with a group when doing either a sunrise or sunset shot as there can be safety in numbers, never go out alone if possible unless you have something to protect yourself with. I almost had my car stolen when I when I once went out alone for a sunrise shoot but the weather was not favorable after waiting for an hour so I decided to head home before the magic hour and lo and behold someone was trying to break into my car through my rear left door using a metal ruler. I managed to attack the guy using my tripod but I was very lucky (and stupid) as he ran away, I should have just activated my car alarm from afar and hidden which would have scared him away (that would have been the smart thing to do), the lucky part was because the guy was alone and also afraid of getting caught hence I must have scared him. But as a result my tripod and car door was busted, I managed to repair the tripod myself but I think the head it presumably not able hold as much weight as it did before and it cost me about Rm250 to repair the dang door. Also I could have been hurt or killed had that guy decided to fight instead of fleeing. So next time, go in a group. I don’t think any thief would take on a large group of people with big tripods. Speaking of camera gear, if you plan on shooting a sunrise or sunset always bring a tripod and no, that VR/IS or any image stabilization gear is only meant to help you get a good clear shot most of the time and never every other time and since you have time to setup why not use a tripod instead? Also if possible have a shutter release cable/remote for your camera as it will ensure minimal shake to your camera when pressing the shutter release button. But if you don’t have one then you can use the timer on your camera and it gets the job done as well. These simple step will help you in getting the sharpest shot possible (do not attempt to handhold until you are confidant enough with your hand holding skills). Another additional gear you might want to bring would be some half ND filters (cokin or filter thread type) which might help you balance the exposure of the sun and the rest of the environment in the shot. But if you find this troublesome, another way it to do it in digital is to shot 2 shots of the same scene (without a single difference in composition, this can be easily done when the camera is mounted on a tripod haha!) with each shot meter for the 2 conflicting area and then merge them together in post-processing or if you like, take a few shots without different exposure settings and merge them all together to create a HDR pic (I will save that for another time). Determine what is indeed the magic hour in the area you are going to. Determine which location is best to take these shots, going to the West of an island to take a sunrise pic is simply not a good idea unless you can find a VERY high place like the top of a mountain. Gather a group of people to go along with you who also enjoys these things. Safety in numbers. Bring a tripod, it helps with ensuring the sharpest pic (also note to those who use Nikon’s VR, turn them off when mounted on tripods. Since VR consumes battery power). Also have a shutter release cable or remote to trigger the shutter remotely, you can also alternatively use the timer on your camera to do it as well. If you find that the shots are either over or under exposure in some parts you can use a split ND filter or just take 2 different shots of the same seen but without changing the composition (mount the camera on a tripod) with each shot metered for each of the conflicting regions. I hope I haven’t miss anything else important. If I have or if you know anything else that can help please drop me a line and I’ll amend this article and credit the changes to you. So until then pleasant dreams~! This entry was posted in GearReview, KL, penang, photography, rants. Bookmark the permalink. 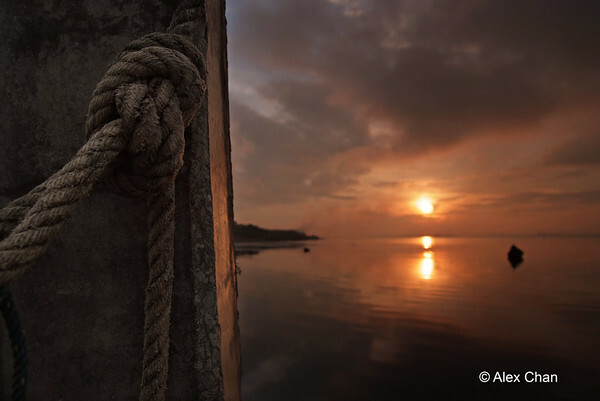 I think i’ve yet to get up early for the sunrise… one of this day.. gonna try it..